especially on days like today... our grandson's birthday! This weekend was Isaac's birthday party & its no fun when the grandparents are like 12,593 miles away. I know that's probably not right - how many miles is it AROUND the world? Close to that? But that's what it feels like anyways. 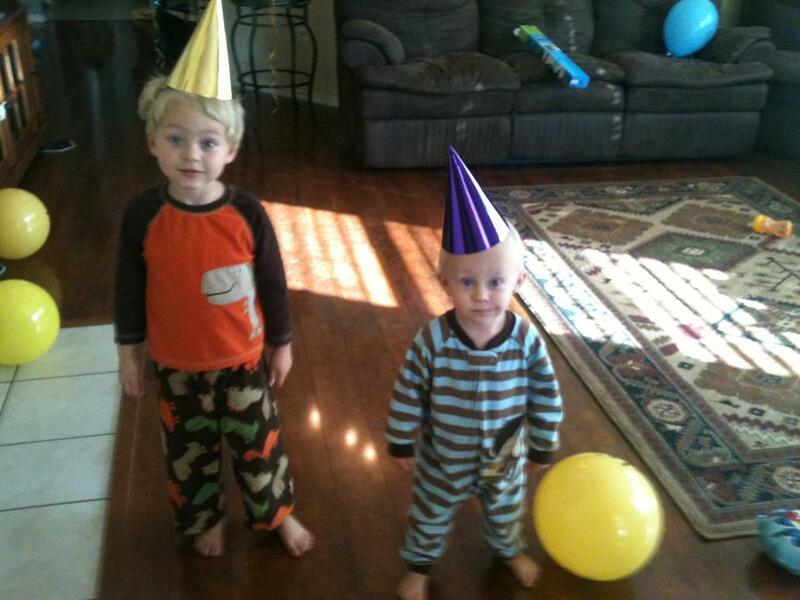 Here are both of the boys... ready to PARTY it UP! Luke is like, where's MY party? Julie let Isaac decorate his own cake. He helps her make things in the kitchen & loves to get involved so this was perfect. 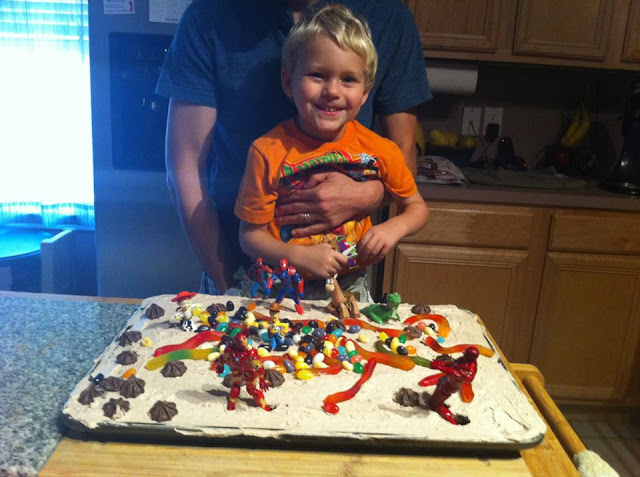 Especially since he wanted a Spiderman - Buzz Lightyear - Ironman cake... who doesnt, right? Julie gave him some candy & he brought some of his toys & VIOLA!!!! A perfect 4 yr old birthday cake. How proud is that face of his? Cake Boss - you better watch out! (I'm totally decorating my 40th birthday cake with my own Beauty & the Beast toys...). Aww, I know you must miss them terribly. I keep hoping Julie will find a great job in this area and move those babies closer to you! I love watching your grandbabies grow up...they are so precious! The boys are adorable! Great cake decorating too! I like the idea for your 40th one--made me chuckle. that is a very proud face and an awesome birthday cake!!! How very sweet is that face & that cake! How cute are they in their hats! And that cake is FABULOUS. You'll post a picture of yours after you decorate it won't you? awww...sorry you couldn't be there to celebrate with those cutie pies. awww they are soo cute! i'm so glad that my nephew is back in utah with me now so that we can be there for his birthday! one month and he will be one! oh my gosh, it is crazy how fast they grow. Happy Birthday! What a fun cake! Happy Birthday! The cake is awesome!